A slow-growing cherry with drooping branches, Snow Fountains weeping cherry (Prunus "Snofozam") is grafted upon a straight trunk of another cherry. It is also sold under the name "White Fountain." It grows 8 to 15 feet tall and 6 to 12 feet wide, but if not grafted onto a tall trunk it will grow like a sprawling ground cover. Prune the plant as needed to maintain the best form in late spring after flowering ends. In autumn the leaves turn orange and scarlet. This pendulous tree is best grown in USDA zones 5 through 8. Trim off all branch tips that are touching the ground with hand pruners. Make the pruning cut 1/4 inch away from a leaf, dormant bud or at a branch junction. Look at the top of the weeping cherry and note if there are any blatantly upward branches. If you wish to maintain the tree at the same overall height, prune off these upright, non-weeping branches 1/4 inch above their point of attachment to a lower branch that weeps and forms the top of the tree. If you want a taller weeping plant, let the upright branches grow and they will naturally bend over and weep over the next two or three years. Examine the tree for any dead, diseased or damaged branches. Dead branches are dry and brittle and lack foliage or flowers during the growing season. Broken branches or those that are rubbing against each other and wearing away bark need to be removed. Make pruning cuts 1/4 inch above a branch junction, leaf or dormant bud. Stand back and look at the overall uniformity and shape of the canopy of the weeping cherry. Trim away any errant branches to ensure the tree looks balanced. Consider removing some branches if a side is particularly "heavy" or dense with branches, as they may be shading each other from light and not permitting wind to readily pass through the tree's canopy. Overly dense branching can put more strain on roots on windy days or in a storm. Strive for 2-inch spacing between main weeping branches at the top of the plant. Clear the trunk of the cherry tree of any leafy stem growths and prune them off flush with the trunk. Do not damage the tree's trunk or cut off the graft-union, the spot where the weeping Snow Fountains plant is fused upon the trunk of the rootstock cherry tree. Trim away any horizontal stems from the drooping branches if you don't want a broader and larger tree. The lateral branches will eventually bend downward, but often put unnecessary stress on the weeping branches from which they originate. 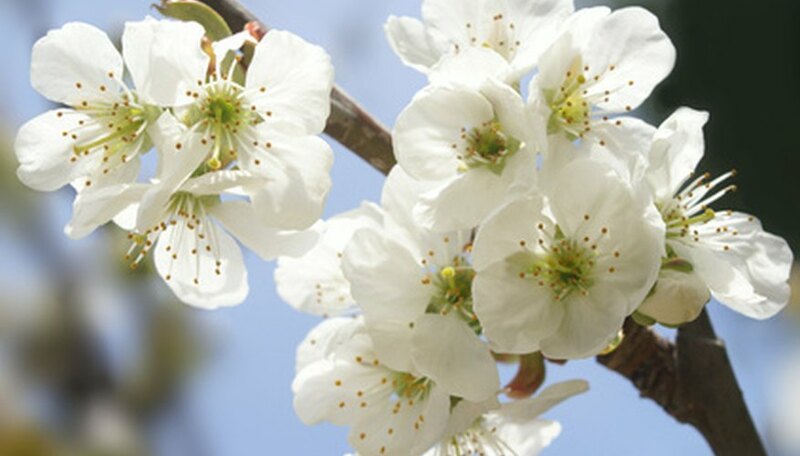 Avoid pruning in late winter as sap may bleed in profusion from the cut wounds, and do not prune later than mid-summer since you want the new growth to mature well before the first fall frosts occur. If your Snow Fountains plant is growing as a ground cover, only focus on removing upright branches and allow horizontal and ground-touching branches to remain. Do not prune into or remove the graft-union on the top of the Snow Fountains weeping cherry. If you remove the area where the weeping branches originate, you cut away the plant tissues genetically able to form weeping branches. Once the graft is removed, the cherry rootstock/trunk will sprout and become a regular, upright cherry tree or die. Missouri Botanical Garden: Prunus "Snofozam"